The table below lists the 730 records of Dartmoor cairns published by L.V. 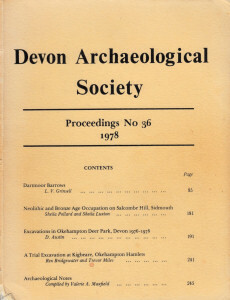 Grinsell in his article Dartmoor Barrows in the Devon Archaeological Society Proceedings No 36 1978. This article was the first attempt to give a serious listing of the cairns on Dartmoor. There had been during the days of the Dartmoor Exploration Committee, in the late nineteenth and early twentieth century, accounts of cairns and cists but never a systematic listing of cairns. In 1952 Dixon pulled together previous accounts to list cists but the task of listing cairns was a mammoth undertaking that had to wait until Grinsell published his 1978 paper. The records relating to Dartmoor cairns still to this day include details first established by Grinsell. The listings on this website use the most accurate and up to date data including data accurate to within a handful of metres for sites that have been visited using GPS or can be seen on Google Maps. However, still many of the grid references for minor sites will be those recorded by Grinsell in the 1970s! The author of this website spent 6 months compiling and cross-checking cairn records and it soon became apparent that much of the data has it's origins with the records compiled by Grinsell. The listings that follow are a modified version of Grinsell's list. There are records of cairns and then there are actual prehistoric cairns visible today. It is important in listings to distinguish between records and real sites. With large numbers of sites it is not difficult for records to get confused and for duplicates to result. Are there 6 cists in the vicinity of the Blackabrook or have the records of 3 cists been duplicated? That particular error on the HER has been identified and corrected. There are 3 cists. Then there are also sites which once existed and are no longer visible. These include, for example, sites excavated in the nineteenth century but can no longer be pin-pointed, the original details are insufficient to identify the site with certainty or the site may have been destroyed. There are many sites that have disappeared over time either due to being robbed out for gate posts, road mending and wall building or possibly due to rising peat levels. Then there are also sites which have been destroyed by ploughing or industrial activity. The records of these sites are of historic archaeological significance and it maybe that some of the sites will be rediscovered. The grid references for many of these records are 6 digit only - converted first to 8 digit and then to 10 digit for this listing. Clearly they are at best accurate to within 100 metres which is as good as gets for historic records of sites that can no longer be pin-pointed. In addition to the records of sites that no longer exist there are also many records which are ambiguous in terms of interpretation. For example, some remains of hut circles can be misinterpreted as cairn circles. In most such cases it is still a prehistoric site but the interpretation is dubious or disputed. Conversely some sites that are clearly cairns have been wrongly identified as hut circles. To add to the complications there are also some hut circles that were clearly deliberately converted into cairns, so they are both! Also there are many other sources of mounds and structures on the moor. From the historic period there are pillow mounds which were connected with the rabbit warrens. There are also clearance cairns which could date from agricultural activity in the medieval period. Then there are also mounds and pits created by tin miners and peat stacks from the work of peat cutters. In the indiviual site listings there will be a cairn class field set to Yes/No/Maybe. Of course that is a subjective decision based on the author's interpretation of what is in the records. Most authors will create a polished and final version of a web page before publishing. The website now has approaching 2000 records relating to cairns and it could take years to tidy the listings up into a polished version. For this reason I'm publishing now as a work in progress. This will allow similar listings for the cairns listed in the first 4 volumes of Butler's Dartmoor Atlas of Antiquities to be made available shortly. The core listings were compiled earlier this year and the delay is finding the time to code the pages to make them available. The table below and the Butler tables to follow are basic versions of the listings. I hope to improve the layout and design so more information already stored in the database can be displayed without resulting in too many columns. For now some further detail can be found by opening up the individual page for each site. For researchers though the core data - the linking of the listings from Grinsell, Butler, Turner, the NMR and HER is completed. Inevitably with a dataset this big there will be errors. I have seen how one author transposes 2 digits in a grid reference and for decades afterwards the error cascades down in subsequent listings. Please let me know if you spot any errors and I will correct them! The table currenly alternates between grey and white to make it easier to view as is the style for this website. The light blue rows are those records that have been marked in the database as either no longer existing or of doubtful existence. The listings on this site prior to the addition of these new records (see Prehistoric Dartmoor Map) only included known existing sites that could be visited and seen. The new cairn records added include many dubious records. For example there are 120 sites listed by Butler which would appear to be from aerial photography in the 1980s but appear nowhere else. Are these lost records? Or have they subsequently been dismissed as not archaeological sites? I have as a temporary work around introduced new categories for site types Reported cairn and Clearance cairn. Ideally the Reported cairn records should eventually be re-assigned in some way to something more definite however that could entail years of fieldwork to clarify what they are. The Clearance cairn type relates to all mounds that are not prehistoric cairns - I may rename to something like "Historic period mound" because they are not actually all clearance cairns. This website is not about categorising historic period sites so breaking them down into more specific categories is beyond the scope of the website. The table can be re-ordered by some of the columns by clicking on the link in the header row. Opening up the individual pages for each site will reveal more details not in the table. The bulk of these sites will not appear by default in the search for near by sites listings. That is a conscious decision to keep this website useful as a tool for the walker who wants to plan walks including the major stone circles and stone rows. On a 2km search in some areas the result with all of the obscure cairns and hut circles can be the addition of 50-100 sites which swamps the major sites. However, on the search listings there is a new drop down Display mode which allows the user to request more extensive listings to include the hidden cairns, hut circles, sites deemed "non-sites" (records of cairns not accepted as cairns) and and lastly the duplicate records.